It’s 2018 (almost 2019), and believe it or not, cardigans are no longer associated with your grandma’s closet. Nowadays, this cozy fall and winter layer is making rounds on the runways, the streets, and, of course, Instagram. If you were like us, at first, you were quite cautious when approaching this trend. However, now we’re all about incorporating it into our daily outfits in various ways. Whether as a simple layer, as a statement top or as a dress (when styled correctly), we think our grandmas would be proud that we’re embracing cardigans. Yet, despite all the ones you can currently find in the market, the ones we are eyeing the most are long cardigans. Maybe it’s the extra coziness that their extra fabric proposes or maybe we simply like playing with styles and lengths when putting together our fall or winter outfits. Whatever the reason, what we do now is that they make for a great layer and a great fashion moment. That’s why we’ve taken it upon us to search the internet for the best long cardigans. 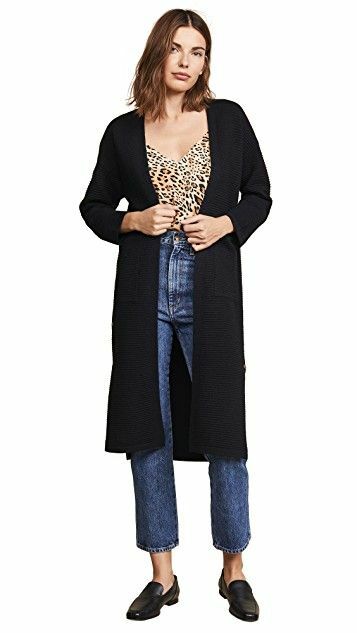 From animal-print long cardigans and oversized long cardigans to cable knit ones that your grandma might even want to steal for herself (and we don’t blame her), we made sure to have a long cardigan that fits you and your style. So keep on scrolling to see (and shop) what we mean. Perfect for running weekend errands. Pair this brown cardigan with all your camel-colored coats. Whether you wear this open or buttoned up, it’ll look great. Complete this look with a sultry red lip. For all your neutral colored ensembles. How chic is this emerald green color? This cardigan will add a nice colorful touch to your winter wardrobe. Slime green is here to stay. Don’t shy away from bold, printed cardigans. We love that this cardigan is under $50. We can never turn away a good faux-fur knit cardigan. This one has pockets, which is always a plus. Oversize cardigans are always great for a cozy and cool look. Channel your grandma’s cable knit cardigans, but make it fashion. Stripes are always welcome on any garment. Hear for this hot-pink cardigan. For all your pastel-colored winter outfits. Nobody will believe this cardigan is only $15. Doesn’t get cozier than this. Okay, so you found your new long cardigan. Read here on how to style it.